Is my reality the same as yours? Are there multiple realities, or is there only one? What we refer to as reality is actually an entirely subjective experience, one that’s different for each of us—as in, what’s real for me isn’t real to you. It’s a matter of personal perception. The world I live within differs vastly from yours. We each create our own reality through the power of our own belief—but belief does not make something true, and this is where the entire Truth of our reality falls apart. As long as our mind is busy interpreting the world around us and applying conceptual opinions to it, our reality is virtual. There is only Truth and non-truth. 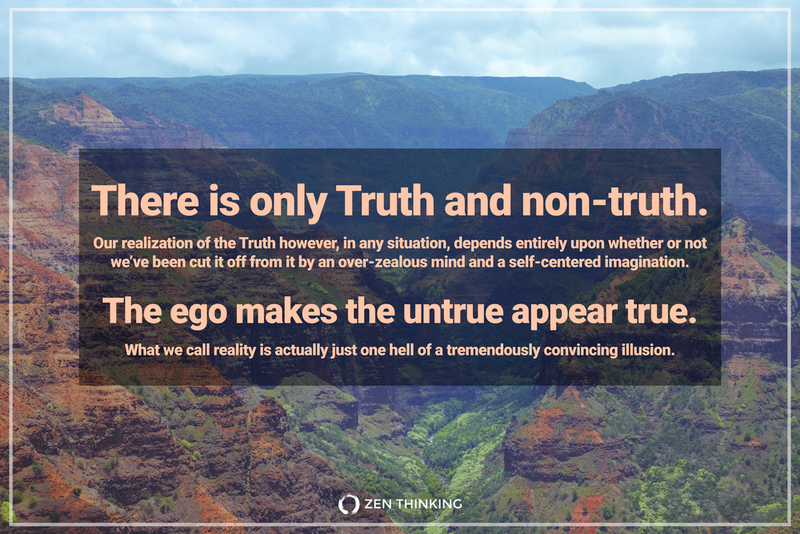 Our realization of the Truth however, in any situation, depends entirely upon whether or not we’ve been cut it off from it by an over-zealous mind and a self-centered imagination. Reality is the sphere of perceptions within which we contain (and limit) our lives; it is a psychological framework maintained by ego and fuelled by the over-thinking mind. But the Truth, unlike the so-called virtual reality we exist within, is immune to perception—it stands outside of any such subjective opinion. The Truth cannot be modified or conditioned by anything other than itself. That which is, is. The Truth is unchangeable. It is absolute. Your reality (your conceptual understanding of life) surrounds you like a protective bubble—but it is only a sense, it is not real, it is a false projection from your perceived sense of self. It is one sense that has created another sense, similar to how your mind might sometimes imagine a spider crawling across your arm, and you frantically begin to itch—meanwhile, neither the spider nor the itch actually exists. They were both illusions. The itch was just a byproduct of the illusion of the spider, just as your version of reality is a byproduct of your sense of self, or rather, your ego. Your false self interprets everything it perceives using its existing modalities of belief as a filter for further mental processing, and ultimately for either your approval or rejection. If and when something falls outside of your conceptual understanding and existing set of beliefs, the ego will shun it, reject it, and flag it as something that's unable merge with your virtual reality. It will appear in your conscious mind as either unrealistic or make-believe, or as a farce and a sham—even if it is absolutely True. The ego makes the untrue appear true. What we call reality is actually just one hell of a tremendously convincing illusion. So if we don't question everything we believe then the protective bubble of our ego will never be popped. To see the Truth for what it is, and to be free from our own self-induced delusion, we first need to wake up. We must burst the bubble of self! We must strip away all that is false and untrue, and only then will we see reality for all that is True. The Truth of our being is obscured by this delusion of a false, separate, and individual sense of self (what we call Me) that we each possess, with all of its firmly held beliefs, opinions, concepts, memories, desires, aversions, cultural conditionings and acquired understandings. Our false self is an all-powerful world-building tool—it can make anything appear real. But whatever the self creates is not true, it is vaporous and will dissolve under the scrutiny of unbiased awareness. For each of us, there is only the known and the unknown—where we call the known “reality", while the unknown is nothing but a far-fetched dream. But in fact, it’s that which we claim to know, but don’t yet understand, that is what cuts us off from realizing the Truth of our being. It is our so-called knowledge that prevents us from realizing the Truth because our mind is so unreceptive to it, since it already believes that it knows. This is the arrogance of the false self. For most people, this deluded state is their ultimate reality—no matter how untrue it actually is. And this is why so many people’s realities are filled with constant pain, suffering, hardship, anxiety and struggle—because they’re living in the deluded dream state of non-truth. It is the false self that creates this virtual reality where wars are justified, where it makes proper sense to profit from the poor, and where political power, fame and fortune, above all else, remains supreme. The self creates its own reality—one illusion creating another. In Truth however, there is nothing to be gained and nothing to be lost. We all return from whence we came, empty handed. So, what exactly is the Truth of reality then? It is that which is untouched by mind. It is all of that which is within the pure awareness of direct experience, without any addition of ego, self, or thought. It is pure and direct, unfiltered knowing. But the truth of reality goes far beyond what our senses can perceive, as that's only an abstraction, or rather, a small piece of the the overall process of the entirety of the universal experience. The truth of reality is that we are each a universe unto ourselves, as all things are, forever entangled in the eternal ocean of consciousness. The undivided Truth of our infinite awareness remains elusive for most people as it sits outside of their current cultural conditioning and understanding. Only by shedding the false sense of self can a person's sense of reality merge with the Truth itself and become one, undivided by any egoic projection of belief. The Truth of reality is that we are each a drop in an infinite ocean, together forming the one, each of us cresting to the surface for a mere moment so we can each taste the sweet and salty air.